Biobased Polypropylene (PP) Market size was over USD 28 million in 2014 and is slated to grow above 4.5%. Strong trend towards adoption of polymers to minimize overall automobile weight along with reduction in carbon emissions should drive biobased PP market size. Government norms regarding use of lighter materials in vehicles which helps automobiles to consume lower fuel would boost the product demand. Global automobile manufacture has witness growth from 77.6 million units in 2010 to 91.5 million units in 2015. Light weighted materials finds application in medical technology, alternative energy bases, pressure vehicles and wind turbines. Biobased PP market price trend is subjected to low fluctuations unlike crude oil index which could drive industry growth. Automotive manufacturing giants, Toyota Motor Corp. announced to substitute 20% of synthetic polymers used in their automobiles with biobased PP, starting with their inner parts. General Motors uses biobased PP for backing, shelving, trim and Cadillac seats and Ford Flex uses the product in manufacturing internal storage bins. Favorable norms towards addressing environmental concerns to minimize carbon emissions should drive biobased polypropylene market size. U.S. and European government have numerous rules and norms regarding decreasing carbon dioxide emissions and to enhance fuel efficeincy, which is probable to deliver much required push to biobased PP market size. Rising substitute products threats from bio PET and PLA may hinder the biobased PP market growth. Growth in shale gas exploration & production with the advent of hydraulic fracturing may restrict biobasd polypropylene market growth. Companies also plan to invest in research to manufacture bio PP for novel applications which should pave new growth opportunities. 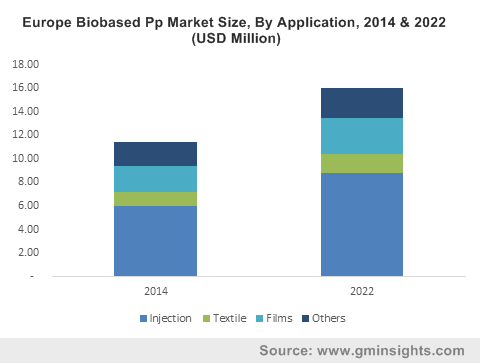 Biobased PP market size from injection application should register over USD 20 million by 2022. It helps to manufacture injection formed parts for construction, automotive, packaging, industrial and electrical applications. Increasing use of light weighted material in automobile industry would boost product demand in injection applications. Also, countries including Malaysia, China, Brazil, Mexico and Thailand witness vehicle industry growth which have a positive influence on biobased polypropylene market size. Biobased PP market size from films application should witness gains at over 4.5%. Increasing green packaging demand for medical and food & beverages application should drive the product demand. Biobased polypropylene film is stretched and extruded to form BOPP and used in packaging of fresh vegetables, snack foods and confectioneries due to its transparency and strength properties. Biobased polypropylene market size from textile applications would foresee demand of above 1.5 kilo tons by 2022. Growing geotextiles demand due to its increasing scope in drainage and soil erosion applications, should drive biobased PP market demand. North America, led by U.S. biobased PP market size, would exceed 6 kilo tons by 2022. Regulatory norms for light vehicle weight in U.S. and Canada due to their lightweight, high biomass content and low GHG emission during manufacturing would drive the regional industry growth. Europe, led by France, Italy, UK and Germany biobased PP market size, should witness significant gains. Government norms regarding use of bioplastics should drive the product demand. Major automobiles players in Germany, France and UK would push product demand to include biobased content in vehicles. Asia Pacific, led by Japan and China biobased PP market size, should witnesses below par industry growth due to presence of synthetic PP product demand. Relaxed government norms in Asia Pacific towards bio derived products usage is expected to be responsible for low adoption rate. Global biobased PP market share is at nascent stage with maximum companies focusing on raw material development. Some companies operating in this industry are Trellis Earth Products, Polymers, Dow Chemicals, Braskem, Biobent and Global Bioenergies. In 2015, Trellis Earth Products conquered the biobased PP market and in 2014, the company acquired Cereplast for about USD 2.6 million. This acquisition helped Trellis strengthening its foothold in product distribution in the U.S. market. The company has its manufacturing units at Indiana, Seymour and distributes the product under ‘Biopropylene’ brand name. Biobased PP is directly converted from different polymers including starch based polymers, natural rubber, cellulose based polymers and lignin based polymers from biomass. CAFE norms in the U.S. were implemented to increase average fuel price of commercial vehicles and passenger vehicles U.S. EPA, in August 2012, reviewed regulations for light commercial vehicles for year 2017-2025, with minimal need of 54.5 miles/gallon by 2025. Canada and Mexico have applied rules and norms associated with the U.S. According, to European Union Regulation(EC) No. 443/2009 needs member states to note information of each new passenger car listed in its area specific emissions of carbon dioxide and data of automobiles numerous body parts. Department of Transportation’s National Highway Traffic Safety Administration (NHTSA) and U.S. EPA are implementing rules and regulations covering the National Program to minimize GHG emissions and enhancing fuel economy by 2025 for light weighted vehicles, which should drive biobased PP market growth.